Holiday Gift Guide #2 - SweetTartStyles. It's always difficult for me to get a guy a gift, because they are simple people who are happy with almost anything, but to me, I like to be the perfect gift giver, so I tend to over think things and make it more difficult that what it probably is! 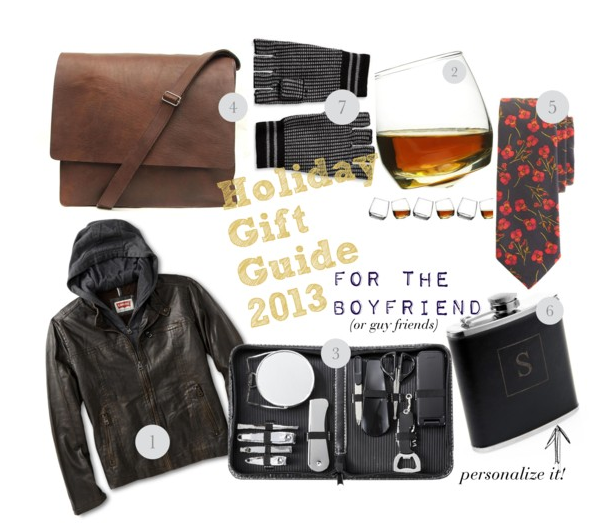 I put together a few items I thought would be nice for a guy to receive whether it be your man or just a friend! 1.) A nice textured jacket on a guy is very nice and attractive to me, I love when my boyfriend wears them, so this is a possible gift this year to him. This one is Levi's brand from Gap and it's $160. 2.) A simple gift maybe more so for a friend, is a nice set of whiskey glasses, men say they like their "Jack & Coke" so why not give them some nice glasses to put it in! This set is from Target for $20, but really you can get a good set of glasses anywhere. 3.) One time I got this men's scissor kit for my boyfriend as a stocking stuffer, and he loved it. It comes in handy for men who have beards or just like to keep neat. It comes with every tool a guy will need and is available at Target for $13! 4.) I love satchels on guys, it's very sophisticated and classy. It can be used for school, work, or a daily basis. This one is from Etsy for $70. 5.) A man in a tie is a nice site, something about them being dressed up is like candy to us girls eyes. A nice tie would make a man who enjoys dressing up happy, most places have nice ties, this one pictured is from JCrew for $70. 6.) A flask to me is such a guy thing, a personalized one would be even cooler, all the letters of the alphabet are available at Nordstrom for $38. 7.) fingerless gloves are my boyfriends favorite, cause you can still touch things and do stuff without the glove so much getting in the way. A variety can be found anywhere from Target, Old Navy, these are from Banana Republic for $30.